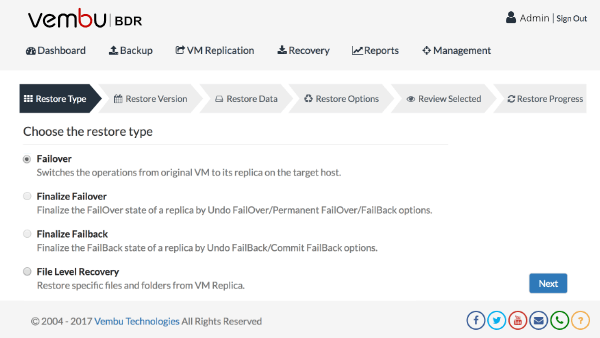 During VM crash or any other disaster, replica failover process helps to recover the replicated VMs at target host. Using Vembu VMBackup, business critical VMs can be replicated from one VMware ESXi host to another. So, in case of system crash or software failure, you can instantly failover the VMs to the required recovery point at target host. Failover process switches the workload to the replica VMs from the source VM for a while when the source VM is temporarily not available due to corruption or system crash. After failing over the replica VM, it will act as source machine and handles all the production activities temporarily. If the VM replication is configured with Network and IP-Remapping, the replica VM will run with the configured Network & IP configurations during the failover process. If Network & IP-ReMapping options were not configured during VM replication configuration, then IT admins need to manually assign Network and IP after failover process. 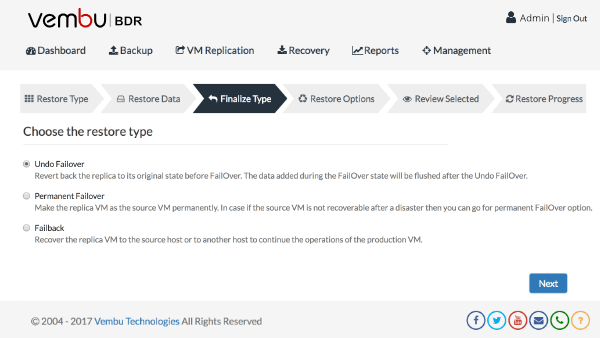 You can failover the replica VMs to any of its available recovery points, and it is also possible to failover group of replica VMs which are actually dependant on one another that are available in the configuration. The data created after failover will be maintained in a snapshot delta file which will be committed/reverted later based on the requirement. Undo Failover is a process of reverting back the replica to its original state before failing over replica VM. The data added after failing over the replica VM will be terminated after the Undo Failover process. Undo Failover might be useful if the replica failover was initiated for testing purpose or if you get the original production server back after troubleshooting and if you don’t want the data that has been added after the failover process. 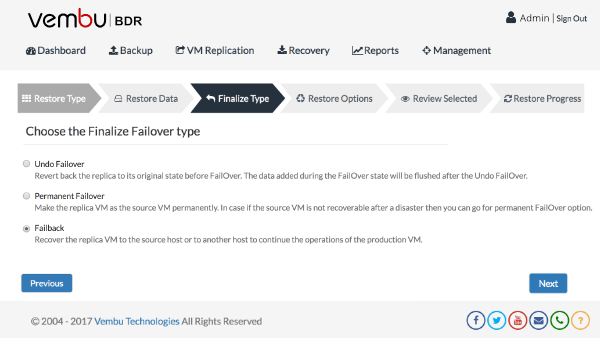 In case the source machine is not recoverable after a disaster or you want to continue business operations with the replica VM itself, then you can use permanent failover option. Permanent Failover helps IT admin to use the replica VM for production purpose permanently instead of source VM. All changes made during the failover process will be committed to the disk once the permanent failover is done. So, all the snapshots of the replica VMs will be consolidated. Further incremental will be blocked for the replica VM after the permanent failover process and the VM will be excluded from the VM replication job. 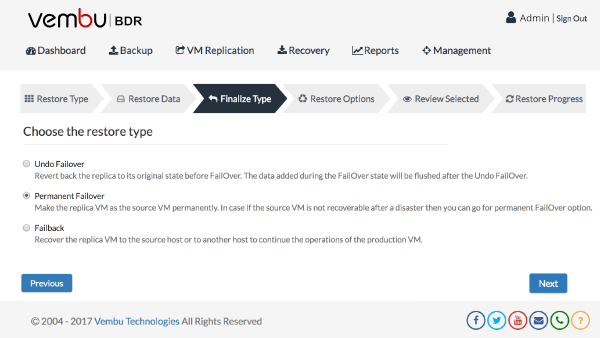 If you want to resume the source VM operation after disaster recovery and shift the production load back to the source VM, you can use failback process.